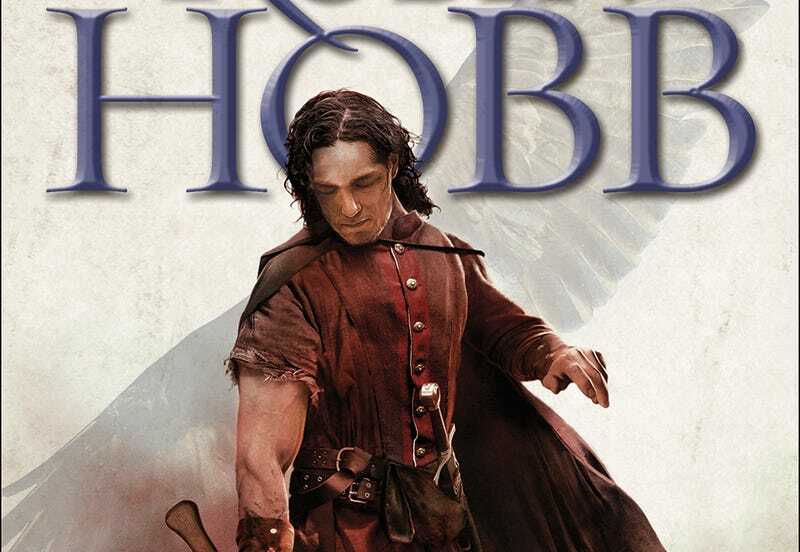 Exclusive Excerpt From Robin Hobb's Fool's Quest: Will Fitz EVER Learn? FitzChivalry Farseer just can’t resist taking in orphans and creatures in need. And that trait will continue to get him into major trouble, judging from our exclusive excerpt from Fool’s Quest, the second book in Robin Hobb’s Fitz and the Fool trilogy. Winterfest might celebrate the lengthening of the days but it did not mean that we were on the road to spring. Yesterday’s clouds had snowed themselves to nothing. The sky overhead was as deep and pure a blue as a Buck lady’s skirts, but more clouds clustered on the horizon. Frost coated the festive garlands that festooned the shop­fronts. The packed snow on the street squeaked under my boots. The cold had subdued the holiday spirit, but scattered vendors of winter sweets and toys still shouted their wares to hasty passersby. I passed a miserable donkey with icy whiskers, and a hot-chestnut vendor who could barely keep his brazier lit. He warmed his hands over his wares, and I bought a dozen just to carry them in my chilled fingers. Overhead, the gulls wheeled and screamed as they always did. Crows were noisily mobbing a tardy owl they had found. By the time I reached the street of the tailors, my drunkard’s nose was as red from the cold as Chade could ever have wished. My cheeks were stiff and my lashes clung together briefly each time I blinked. I gathered my cloak more closely around myself and hoped that the new clothing that awaited me was not as foolish as what I was wearing. Before I could react, another crow dived on it, pecking and flap­ping and cawing. In response to that attack, a dozen more birds ap­peared as if from nowhere to join in the mobbing. As the beleaguered bird took flight, I caught a glimpse of white pinions among her black ones. To my horror, one of the other crows struck her in midair. She tumbled in her flight and then in her desperation took refuge under the eaves of a nearby shop. Two of her attackers made passes but could not reach her. The others settled down on nearby rooftops to wait. With the instincts of all bullies, they knew that eventually she would have to emerge. Then, in the way of their kind, they would peck her to death for being different. Oh, Web, what have you gotten me into? I could not, could not, take in another orphan. She would have to fend for herself. That was all. I would have to hope that she would make her way back to him. I wished he had not sent her in search of me. I hardened my heart and went into the tailor’s shop. My new accoutrements began with a very short blue cape trimmed in layers of snowflake lace. I wondered if the tailor had jumbled Chade’s order with one for a lady, but the tailor and her husband gathered round me to try it on and make some adjustments to the ties. They then brought out the matching cuffs for my wrists and an­kles. The tailor made a mouth at the sight of my distinctly unfash­ionable boots but agreed that they were probably more suitable for the snow. I promised her that the lace cuffs would be worn with my most fashionable bell-toed shoes, and she appeared mollified. The lad who had delivered the order had paid them in advance, so all I had to do was accept the package and be on my way. As I came out of the shop, the light of the short winter afternoon was starting to leak away. Cold was settling on the town, and the traf­fic in the streets had thinned. I did not look toward the crow hunched under the eaves nor at her gathered tormentors. I turned my steps toward Buckkeep. “Tom! Tom!” she cried after me, but I kept walk­ing. Beside me, a thin woman clasped her knotted hands to her breast. “He’s come back!” she cried. “As a crow!” To that, I had to turn, lest others mark how I ignored this sensation. “Ar, it’s just some fellow’s tame crow,” a man declared disdain­fully. We all turned our eyes skyward. The hapless bird was flying up as high as she could, with the mob in pursuit. “I heard you split a crow’s tongue, you can teach it to talk,” the chestnut vendor volunteered. “Fitz—Chivalry!” she shrieked again as a larger crow struck her. She lost her momentum and tumbled in the air, caught herself, and flapped bravely, but she had fallen to a level below the murder of crows and now they all mobbed her. In twos and threes they dived on her, striking her, tearing out feathers that floated in the still air. She fought the air to try to stay aloft, helpless to protect herself from the birds that were mobbing her. “It’s an omen!” someone shouted. And in that instant, terror swept through me. Had I thought ear­lier I recalled what the Fool was enduring? No. I had forgotten the icy flood of certainty that every hand was against me, that the good peo­ple of Buck dressed in their holiday finery would tear me apart with their bare hands, just as the flock of crows was tearing that lone bird apart. I felt sick with fear, in my legs and in my belly. I began to walk away and at every step I thought they must see how my legs quivered, how white my face had gone. I gripped my package with both hands and tried to walk on as if I were the only one uninterested in the ae­rial battle overhead. “He’s falling!” someone shouted, and I had to halt and look up. But she wasn’t falling. She’d tucked her wings as if she were a hawk and she was diving. Diving straight at me. An instant to see that, and then she had hit me. “I’ll help you, sir!” the chestnut vendor shouted and started toward me, his tongs raised to strike the flapping bird tangled in my cloak. I hunched my shoul­ders and turned to take the blow for her as I wrapped her in the fabric. I did not loiter to see if anyone would answer her. My apparent discomfiture at losing my hat and wig seemed to have provided them with some amusement, as I had hoped. Several times before I was out of sight I made seemingly vain attempts to adjust both. When I judged I was far enough away, I stepped into an alley and drew my hood up over my hat and wig. The crow was so still within the fold of my cloak that I feared she was truly dead. She had struck me quite hard, hard enough to break a bird’s neck, I surmised. But my Wit told me that while she might be stunned and stilled, life still beat in her. I traversed the alley and walked down the winding way of Tinker Street until I found another, narrower alley. There I finally unfolded the wrap of cloak that cradled her still, black form. Her eyes were closed. Her wings were clapped neatly to her body. I have always been impressed with how birds could fold two limbs so smoothly that, had you never seen a bird before, you would believe it only had legs. I touched her gleaming black beak. She opened a shining eye. I put a hand on her back, trapping her wings to her side. Not yet. Stay still until we are somewhere safe. I felt no return of the Wit from her, but her obedience made me believe she had understood me. I arranged crow and parcel under my cloak and hurried on toward Buckkeep Castle. The road was better maintained and more traveled than it had once been, but it was still steep and icy in some places. The light was fading and the wind ris­ing. The wind picked up snow crystals as scathing as sand and blasted them at me. Carts and wagons bearing provisions for this final eve­ning of merrymaking passed me. I was going to be late. Inside my cloak, the crow had become restive. She shifted and clung to my shirtfront with beak and claws. I reached in to touch her and offer her support. She fluttered violently and the hand I drew back had fingertips of blood. I reached her with the Wit. Are you hurt? For a time, she did not move. Then she gripped my shirt with her beak and climbed me, reaching to claim a fresh beak-hold with every few steps. She became a lump on my shoulder under my cloak and then moved around to make me a hunchback. When she seemed settled, I straightened up slowly. “I think we’ll be fine,” I told my passenger. The winds had shepherded in the clouds and now they released a fresh fall of snow. It came down in thick clumps of flakes that whirled and danced in the wind. I bent my head and trudged up the steep hill, toward the keep. Copyright © 2015 by Robin Hobb. Excerpted by permission of Del Rey, a division of Random House LLC. All rights reserved. No part of this excerpt may be reproduced or reprinted without permission in writing from the publisher.